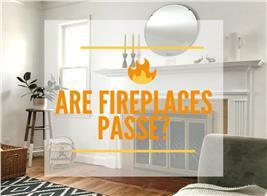 Make Friends and Family Feel at Home This Thanksgiving! Many of us think of Thanksgiving as a time to visit the in-laws, watch football, and probably eat more than we should – followed by a weekend of shopping and more football. And much of that tradition can be traced back in some form to the original Thanksgiving celebration in 1621 – which was one of “feasting, playing games” according to the Smithsonian. These early Thanksgiving celebrations were also ones of prayer and celebrating thanks – for family and friends, for country and home. 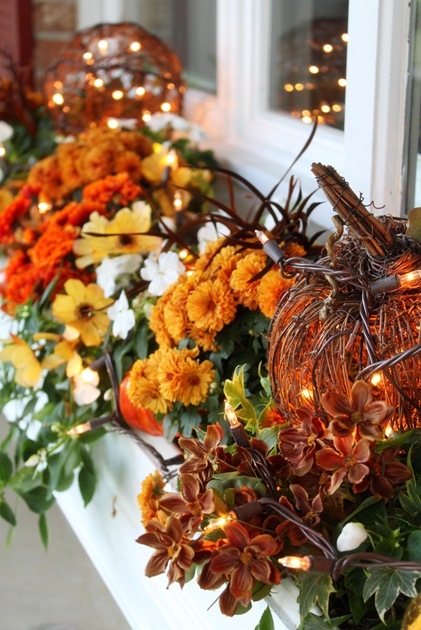 So in following that tradition, what better way to mark Thanksgiving than to decorate your house, whether a Colonial, Country Farmhouse, Ranch, or Contemporary home – the center of the celebration – to welcome your guests? 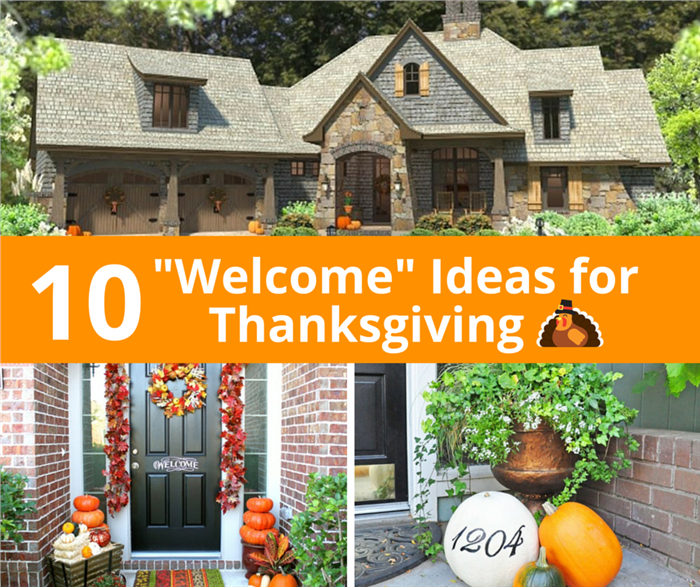 Here are 10 ideas for outside and inside the home this Thanksgiving that may help you add that special touch. 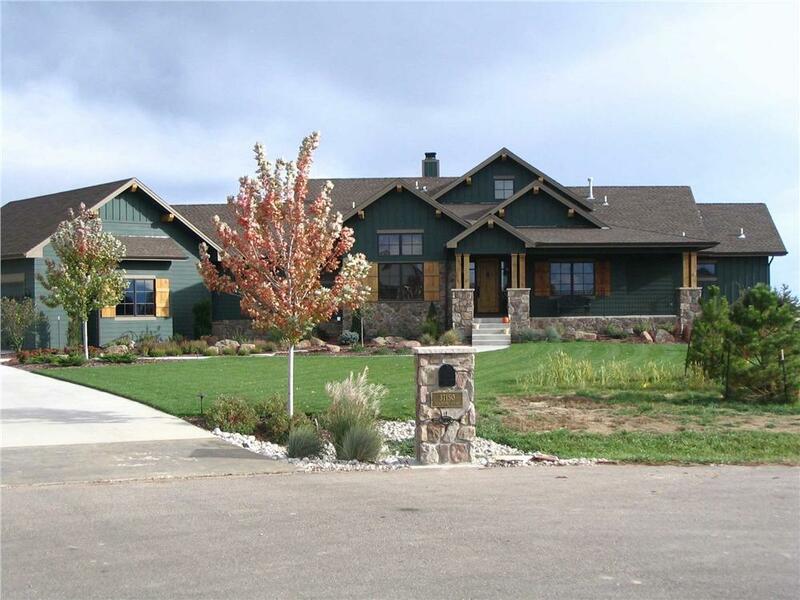 A wreath, a garland of colorful fall leaves (left), expertly arranged pumpkins and gourds, and a little hay and autumnal plants add up to a welcome that would lift anyone’s spirits.This Craftsman-style country home (right) would be an ideal candidate for dressing up the entry (Plan #142-1082)! How annoying is it to look for an unfamiliar house (often the case on Thanksgiving with distant relatives) and not be able to see house numbers? 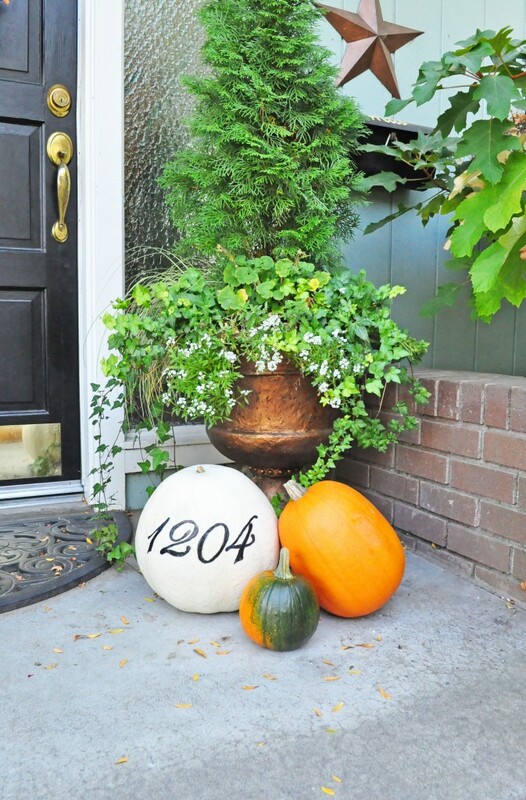 Painting your number on a large squash or other light-colored gourd is a clever – and practical – decorating idea! 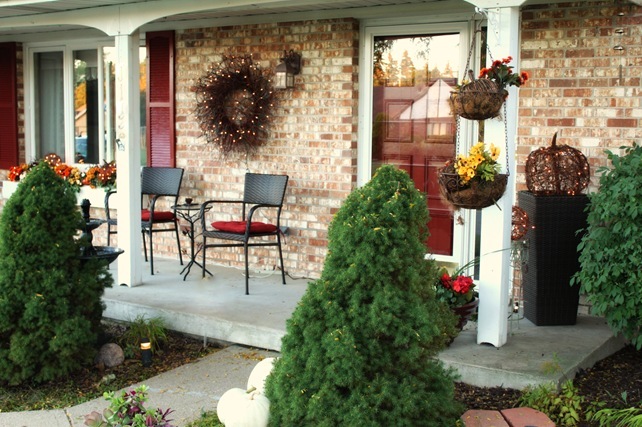 As you approach the door (left), you may notice the autumnal-themed window box and the white gourds at the top of the walkway. But there’s a lot more to take in. 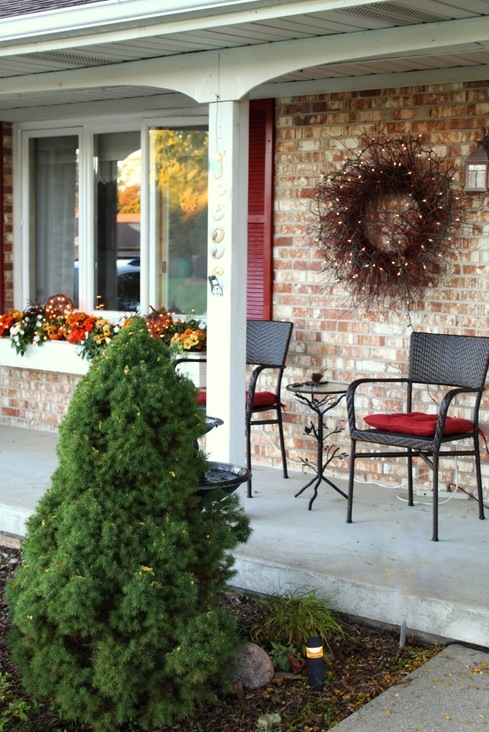 From a different angle (right), you notice the woven-branch, lighted pumpkin to the right of the door and wreath hanging to the left. A closer look reveals additional details: more woven, lighted pumpkins among the colorful flowers (left) and full appreciation of the wispy lighted wreath (right). 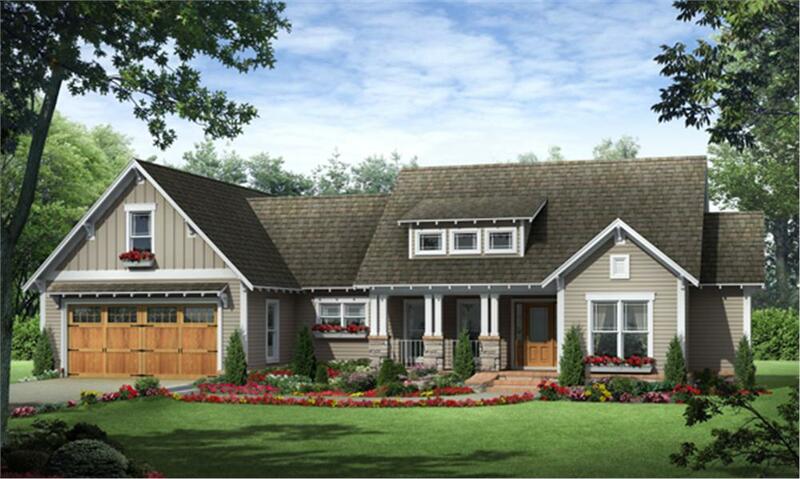 Can’t you just see the treatment above on this 3-bedroom, 2-bath country Craftsman home (Plan #141-1245)? 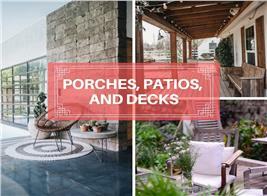 Many front porches have a rocker, a place to enjoy the world going by. 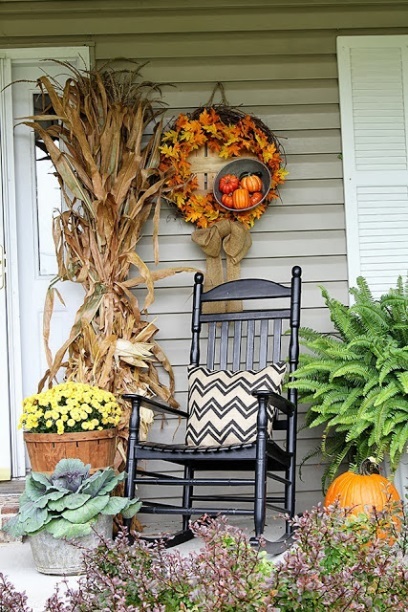 Any front porch can be festooned with corn stalks and seasonal accoutrements to welcome holiday visitors. 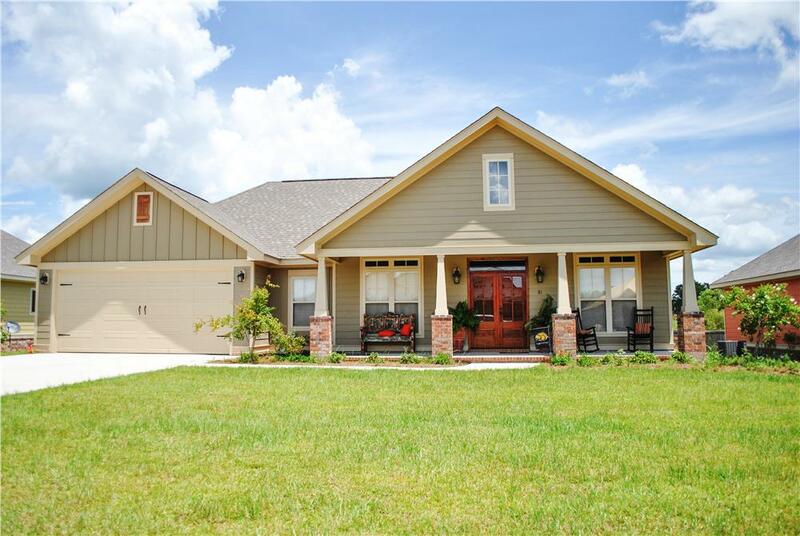 The beautiful front porch of this 3-bedroom, 3-bath Farmhouse home is perfect raw material for a decorative autumnal welcome (Plan #165-090). 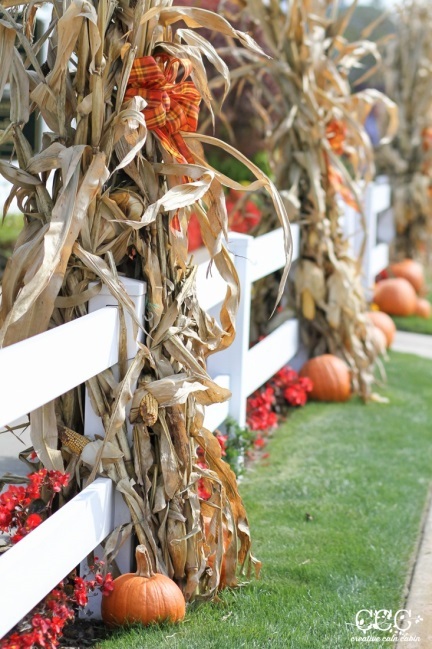 A simple decoration of orange-yellow-black plaid bows (left), corn stalks, and pumpkins on a fence creates a festive ambiance as you approach the house. 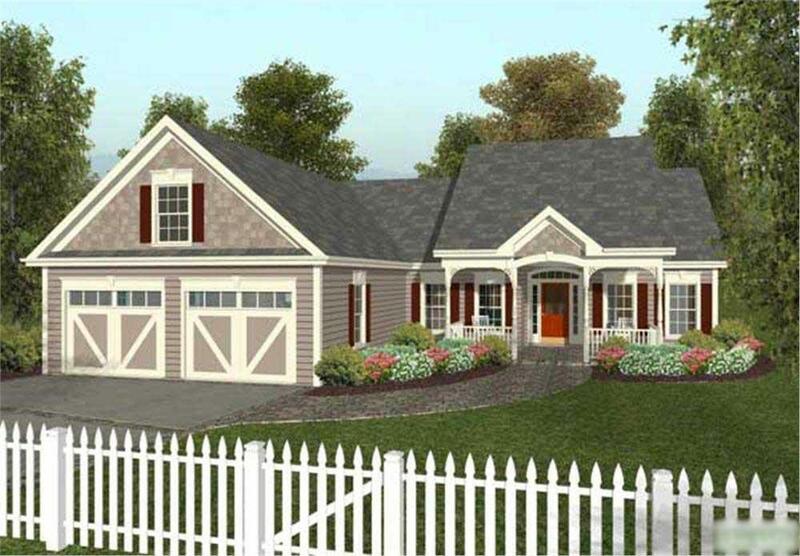 Imagine harvest cornstalk decorations along the fence of this lovely 3-bedroom, 2-bath country home (right, Plan #109-1028)! 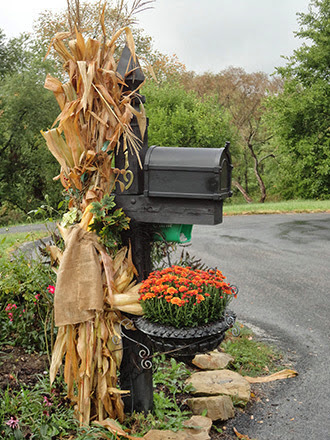 Many rural and suburban homes have mailbox posts set somewhere in front of the home. 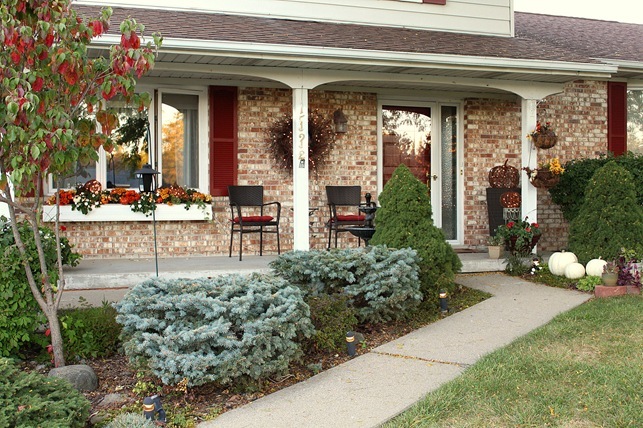 Often a neglected spot, it can be brightened up for the holiday with some cornstalks, burlap, and seasonal flowers (left). Beautiful! The mailbox of this lovely 5-bedroom, 4½-bath Traditional home (right) is an ideal candidate for welcoming holiday decoration (Plan #161-1005). 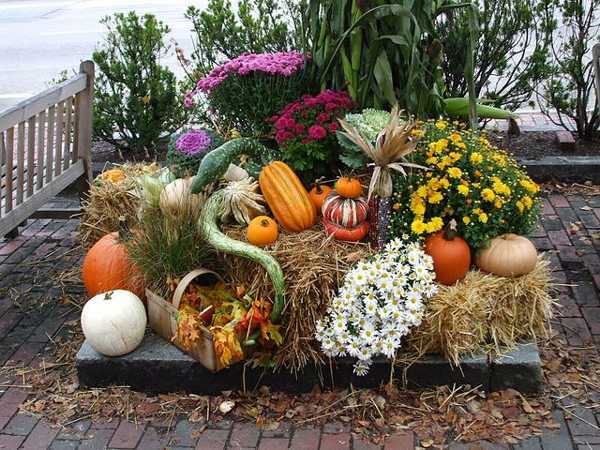 Ordinarily a raised flower garden in a corner of the front patio of a suburban/urban home, this area becomes a beautiful harvest display perfect for Thanksgiving. 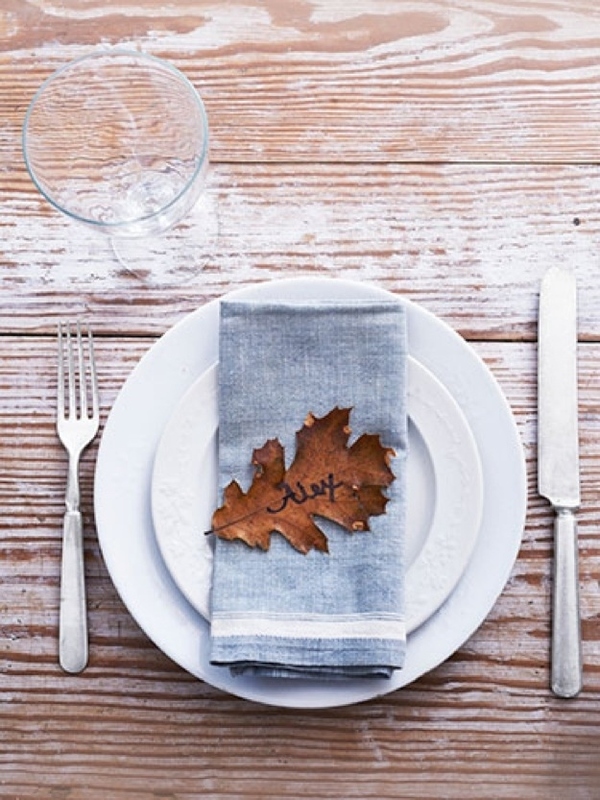 Autumn leaves (left, oak here) with names of guests provide an unusual and simple decoration for the Thanksgiving table. 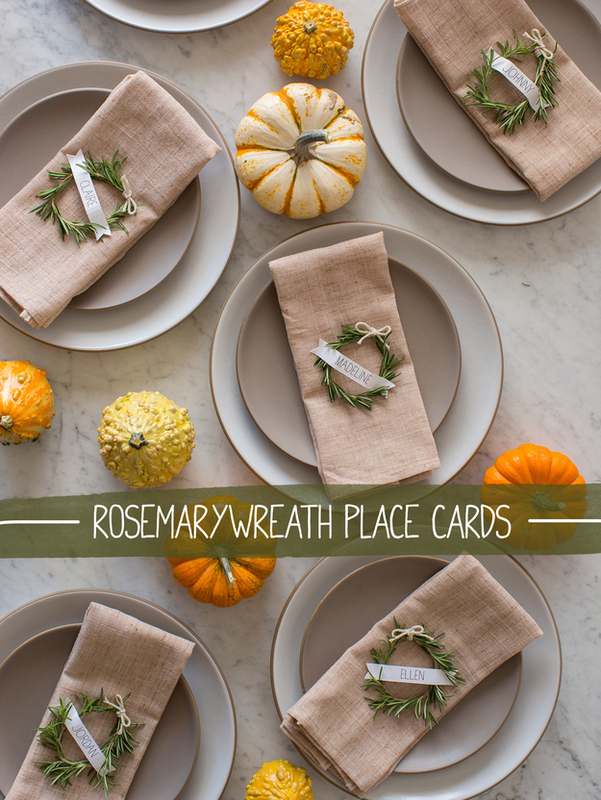 Form a sprig of rosemary into a wreath (right), add a printed ribbon or paper label, and you have unforgettable place cards for Thanksgiving dinner. 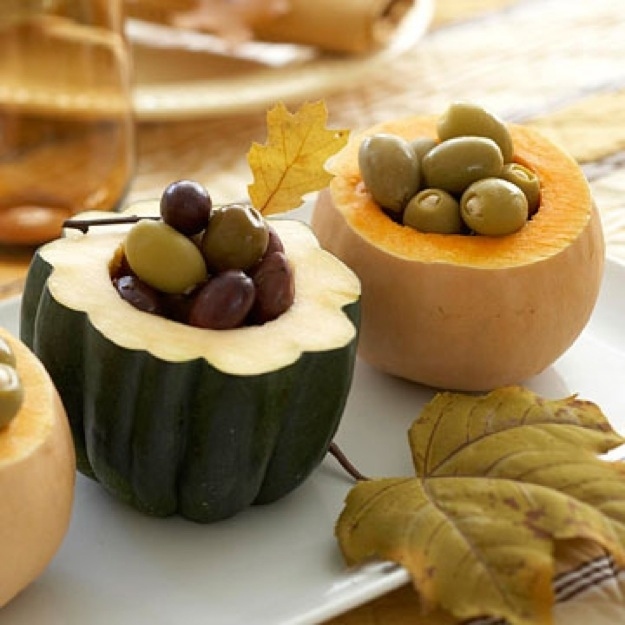 Serve game-time, pre-dinner Thanksgiving appetizers in bowls formed from hollowed-out squash and gourds. 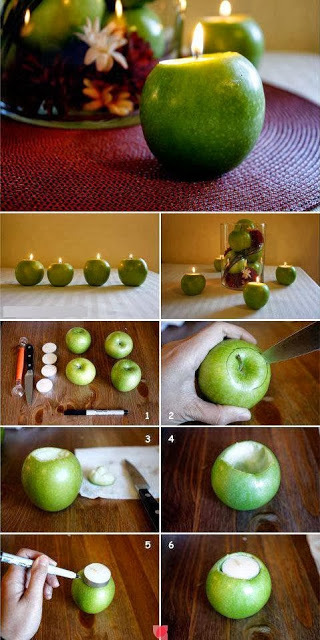 Hollow out green or red apples to form a cavity large enough for small tea-light candles, and you have beautiful accent lights to adorn your Thanksgiving table. 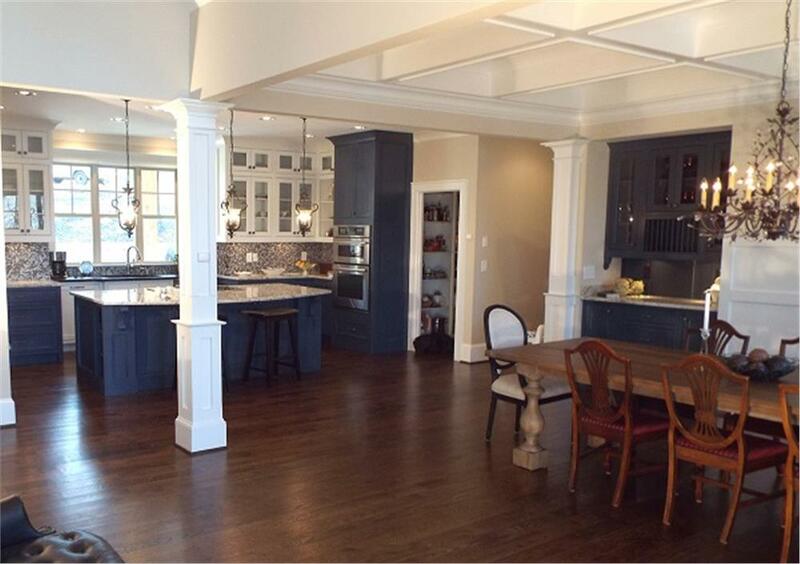 Imagine Thanksgiving in this open floor plan space, with place settings (#8) and accent lights (#10) on the dining table and appetizers (#9) arranged on the kitchen island (Plan #106-1274). 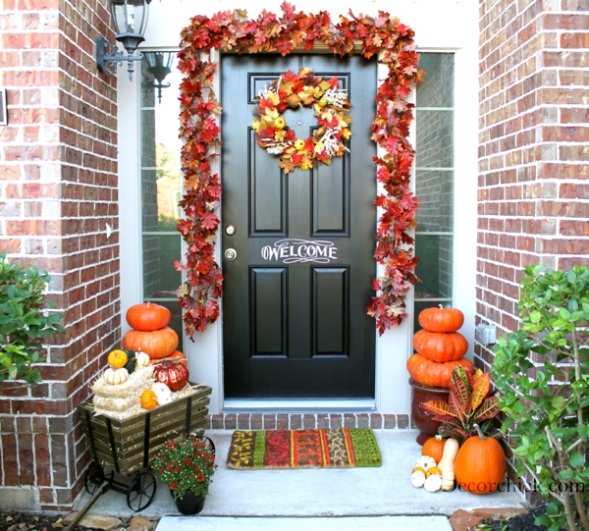 Now that you have some ideas for inside and out, deck your home for the holidays to welcome family and friends and make Thanksgiving warmer than ever! Most of us are familiar with the popular story of Thanksgiving. But how did Thanksgiving become such a monumental national holiday, a day (rather, four-day weekend) of celebrating family, friends, and home? In 1621 the Pilgrims of New England held a three-day-long Thanksgiving feast to celebrate the harvest and the blessings of the past year, complete with eating, drinking, and playing games. So for 150 years the holiday has had official recognition, but for many more years than that it has been celebrated in the hearts, hearths, and homes of most Americans. It is a day of gathering far-flung family, eating a hearty meal, watching football, enjoying each other’s company . . . and beginning the Christmas season. 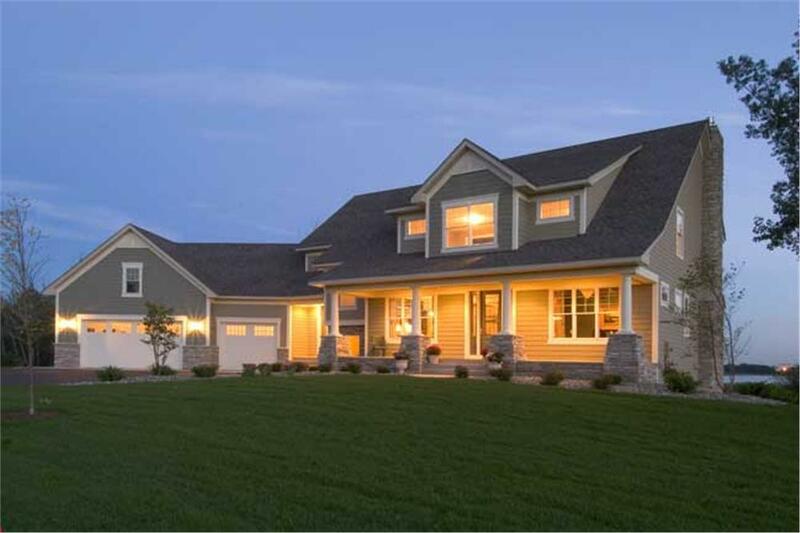 Footnote: The lead (top) image in this article is a beautiful 4-bedroom, 3-bath one-story French-inspired Craftsman cottage built in a woodsy area. 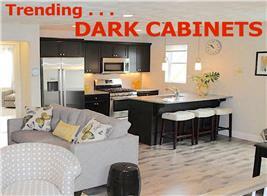 For more on this house plan, see Plan #117-1102.